Zendo (禅堂, Chinese: Chántáng) is a Japanese term translating roughly as «meditation hall». In Zen Buddhism, the zendo is a spiritual dojo where zazen (sitting meditation) is practiced. 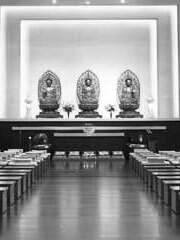 A full-sized Buddhist temple will typically be divided into at least one zendo as well as a hondo (本堂, literally «base hall», sometimes translated as «Buddha hall»), which is used for ceremonial purposes, and a variety of other buildings with different functions. However, any place where people go to practice zen can be referred to as a zendo. Enter the zendo on the left side of the entry, left foot first. Gassho and bow to the altar. Walk forward across the room past the altar and go to a seat turning corners squarely (cross in front of the altar only during kinhin). Gassho and bow toward the seat, greeting the people to both sides. The people on both sides respond to greeting. Turn clockwise and face front. Gassho and bow to those directly across room, greeting them. They respond with a gassho-bow in greeting. Sit down on the zafu. Always turn or move clockwise as viewed from above the zendo.